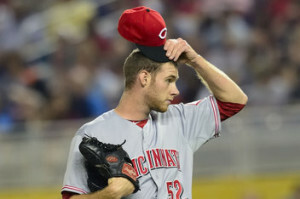 The Cincinnati Reds have made it official, Tony Cingrani will be called-up from Triple-A Louisville to make his first start on Tuesday since being optioned to Louisville on May 18. In his six starts since getting his first call-up on April 18, Cingrani was solid for the Reds, posting a 2-0 record and 3.27 ERA, along with a solid 41/9 strikeout to walk ratio in 33.0 innings of work. However, whether or not his success in the big leagues would have continued is a matter of debate, as he relied heavily on one plus pitch, his fastball. A short stint in the minors to develop his pitch arsenal would be the prescription for the young Cincinnati southpaw. In three starts with Louisville, Cingrani posted a 2-0 record and 2.02 ERA in 17.1 innings. In his most recent start on June 2, Cingrani went seven strong innings, surrendering three runs and striking out nine batters with no walks. With Johnny Cueto out of the starting rotation with a shoulder injury, Cingrani should fill in nicely for the Reds. Cingrani will make his seventh start of the season on Tuesday against the Chicago Cubs at Wrigley Field.